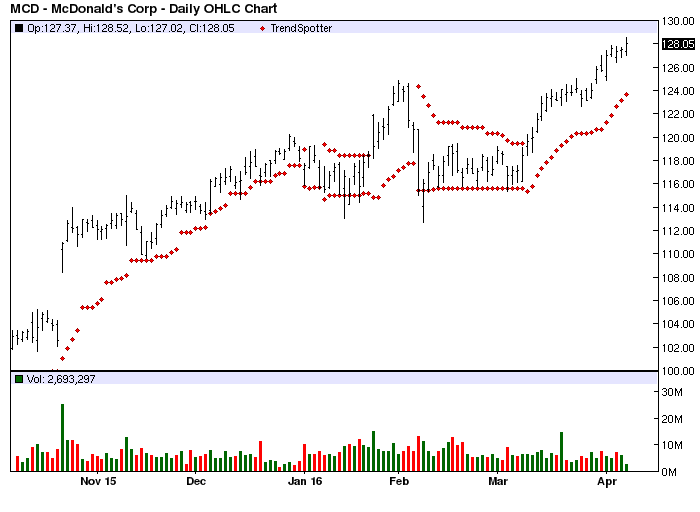 The Chart of the Day belongs to McDonalds (MCD). I found the mega fast food stock by using Barchart to sort the All Time High list first for the most frequent new highs in the last month. then for technical buy signals above 80%, Next I used the Flipchart feature to review the charts for consistency. Since the Trend Spotter signaled a buy on 3/9 the stock gained 7.10%. McDonald's Corporation develops, operates, franchises and services a worldwide system of restaurants that prepare, assemble, package and sell a limited menu of value-priced foods. The company operates primarily in the quick-service hamburger restaurant business. All restaurants are operated by the company or, under the terms of franchise arrangements, by franchisees who are independent third parties, or by affiliates operating under joint-venture agreements between the company and local business people. The 20-100 Day MACD Oscillator has been a reliable technical trading strategy for this stock.